It seems I have lots of friends who are just now dipping their toes into the stitching pool. We’ve been talking supplies lately, so here’s my list to get you started. Sewing Machine. Unless your mother-in-law’s machine can live with you for weeks at a time, don’t plan on borrowing. It just makes everything so much harder. Here’s a link to the affordable-with-extra’s sewing machine I purchased a year ago. It’s working out nicely! Sewing Machine Needles. Clearly you need needles (need needles, need needles!… sorry). All the options can be confusing. Buy a multi-pack with several sizes so you’ll be ready to work with different weight fabrics and a pack of size 12/80, which is a the size I use most. It doesn’t hurt to get extra so that you’re not stuck if a needle breaks. Thread. I recommend cotton thread because I love natural fibers. Coats & Clark Cotton is a fine start in black, white and natural. Wait to buy colors for a specific project. Higher quality threads like Gutermann are wise choices when you’re working on heirloom items like quilts. You do not want “hand quilting” thread for your sewing machine. Bobbins. These clear plastic disks fit in your sewing machine to feed the bobbin thread. Your machine likely came with a few, but you’ll want more. They’re cheap so buy a pack. Straight Pins. Have some fun picking out a cute set. Cheap and necessary. Woohoo! Tiny Scissors. You’ll be snipping threads all the time at the machine. A small pair of 4″ embroidery scissors stay out of the way and are easy to manage in tight places. Also a must for applique work. Big Scissors. Treat yourself to a new pair of quality 8″ fabric shears. These babies will be for fabric only and as such will remain quite sharp. Using your everyday scissors to cut out pattern pieces can backfire, allowing the fabric to bend and cut wrong. Your hands might also start to hate you. Marking Tools. Grab yourself a plain old pencil. Skip the disappearing fabric markers, as they don’t last long or go on easily. My favorite marking tool is the Clover Chaco Liner (last item on right in above picture). It smoothly dispenses chalk in a neat line. And, if I’m careful, the chalk is there as long as I need it, then brushes away. Seam Ripper. To undo those pesky mistakes that are totally not your fault (and the ones that are). Soft Measuring Tape. After accidentally melting my cheapo measuring tape with the iron, I invested in a retractable one. So far, it’s managed to dodge both iron and scissors. A rotary cutter works like a pizza wheel to cut straight lines SO easily with a special mat and ruler. No one is going to tell you that you MUST start with a rotary cutter set up. But, you’ll never regret the day you get one! 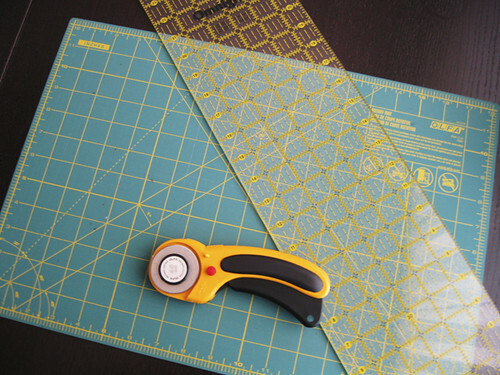 Cutting can be the most time-consuming part of sewing. So, if you have the cash, gear up with these babies from the beginning. P. S. If you are making a quilt, run-don’t-walk to get your rotary cutter setup! 45mm Rotary Cutter. Look for a cutter that seams comfortable, is self-retracting and has a locking mechanism for storage. My cutter is often on sale at big box stores like Joanns and Hancocks. No need to get extra blades just yet. 6 x 24″ Quilters Ruler. These clear, gridded rulers are designed to be used in conjunction with a rotary cutting mat to make getting cuts square a cinch. Start with a ruler that’s 6 x 24″. This is a key size! Once you start using it, you’ll see why. Rotary Cutting Mat. Be sure to buy a “self healing” rotary cutting mat. These are usually dark green and are definitely covered with inch grids and angles. Bigger is better, but these get quite expensive. Also, it should be stored flat so keep that in mind. I started with a 12 x 18″ mat, which works very well for most projects. I can cut everything on it, but I now use a larger mat for long cuts. If you buy all these items on sale (which you should wait for – they come up pretty often) this rotary cutting setup would be about $40. ~Reference the whole series at Stitch Your Life. I’m a book junkie. I’ve always loved reading and have a week spot for the smell of a brand new book. I’m inordinately proud of my bookshelves. Um, there’s even a pile of sewing books I leave out for decoration. The thing is sewing books really are all that. The inspiration is endless. The directions are there. And, when you borrow them from the library, it’s all free! There’s little need for buying patterns, when books like these abound! Bend the Rules Sewing by Amy Karol. This is the book that got me started actually sewing. Very clear directions with Amy’s frank and casual vibe. From sewing a seam to sewing a buttonhole. Easy projects for the beginner. Happy pictures. Slight vintage flare. See what people have made at the Flickr group. The Modern Quilt Workshop by Weeks Ringle and Bill Kerr. My favorite overall learn-to-quilt book that was available at the library. Discussions of technique were very straightforward with lots of “this is why we suggest you do it this way.” I learned a lot! Quilt Making Basics by Elizabeth Hartmon of Oh, Fransson! So this is a link to a series of blog posts, not a book. Elizabeth is an amazing quilter and a great teacher. She’s coming out with her own how-to book, The Practical Guide to Patchwork, sometime in the near future. Can’t wait. Sew Liberated by Meg McElwee. All the ins and outs of how to applique. Meg covers many different methods with precision and helpful tips. Projects are adorable, yet modern and range from beginner to complex. Popular projects: soft baby book, art smock, children’s animal bag, camera bag, apron. I made curtains. See what people have made at the Flickr group. Alabama Stitch Book & Alabama Studio Style by Natalie Chanin. It’s all by hand, but don’t let that stop you – you’ll love it! Natalie’s unique, earthy style lends itself to gorgeously embellished clothing, tablecloths, bags and book covers. I refashioned this skirt. See what people have made at the Flickr group. I Love Patchwork by Rashida Coleman-Hale. Rashida has an amazing sense of style and color. This book is total eye-candy! Lots of linen with modern prints. Projects range from simple to complex. Nice, clear directions. Popular projects (um, all of them! ): calendar, travel sewing book, coasters, sewing machine cover. See what people have made at the Flickr group. Patchwork Style by Suzuko Koseki. Drool. This book is not for beginners, as it features minimal directions and projects with lots of small piecing. However,the projects are amazing! Modern, Japanese style. Popular projects: patchwork rug, pot holders, log cabin blocks/quilts. I made the patchwork rug. See what people have made at the Flickr group. Last Minute Patchwork & Quilted Gifts by Joelle Hoverson. Simply gorgeous. My favorite collection of quilts with clear directions easy enough for the beginner. Popular projects – quilted coasters, rainbow pencil roll, Color wheel quilt, Peanut the wee elephant, pin cushion. See what people have made at the Flickr group. The Gentle Art of Quiltmaking by Jane Brocket. Jane shares her quilting process from inspiration to completion in detail, from color selection to borders to binding, on many beautiful quilts. Her English cottage style is not my own, but I feel I learned a lot about color and scale. See this review by The Sometimes Crafter. Handmade Home by Amanda Blake Soule. A warm, eco-friendly book with a wide variety of practical and memory-keeping projects. Not all sewing. 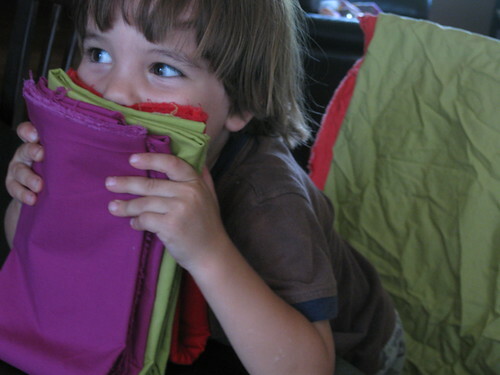 Directions are light, but the projects are easy enough for someone still new to sewing. Definitely favors an earthy, homemaking type like myself. My review here. I made the word banner. See what people have made at the Flickr group. Seams to Me by Anna Maria Horner. Lovely projects in Anna’s glowing fabrics. A good intro-to-sewing section. Popular projects – caddy pin cushion, hexagon patchwork baby ball, purses and aprons. See what people have made at the Flickr group. Sewing Bits & Pieces by Sandi Henderson. Small projects made with fabric scraps. Many show how to embellish something to make it more special. Lots of projects to make for kids! Great directions. See what I made here. See what people have made at the Flickr group. The New Crewel by Katherine Shaughnessy. I have yet to find an embroidery book to love. Crewel is much like embroidery, but more “chunky”. This modern interpretation is packed with amazing designs. Very easy to learn and the perfect way to get inspired for handwork. I made this pillow and this one too. One happy day… your new fabric arrives! Love, love, love!!! You admire it in stacks, unfolded, then folded again. Oh, are you putting it away now? Already? WAIT! If you don’t prewash now, how will you ever remember which fabrics in your fabric stash are washed, and which aren’t? I used to prewash before each project. Oh, how annoying! I’d be all jived about starting something new, only to find myself in prewash slow-motion. And then there were those times I forgot to prewash. Problems! I also used to rationalize that some projects don’t require prewashing, which is true. If you’ll only handwash your project, a machine wash and dry is not necessary. But, then the scraps from that project won’t be prewashed. If you use them along with other scraps, project #2 is going to shrink very oddly. So, save yourself the brain power and prewash before ever putting your new fabric away! (P.S. prewashing removes yucky chemicals from the manufacturing process, so it’s always doing some good, regardless). First I prep my fabrics by unfolding them and placing them in separate delicate bags. The bags prevent the fabrics from tangling with each other when the edges start to unravel in the wash. If you just throw 5 cuts of fabric in the machine together with no prep, you’ll spend quite a while cutting all the threads and then longer mourning the loss of so much fabric edge. Sometimes I have to double up, placing 2 cuts in 1 delicate bag. Doubling up is OK, but anymore than that causes madness. Next, I wash my fabrics on “light” with a little detergent. The detergent will help lift the manufacturing chemicals. I wash on cold, because I’m determined to never wash something I’ve made on hot. If you know you’ll be washing projects on hot, you need to prewash in hot water. 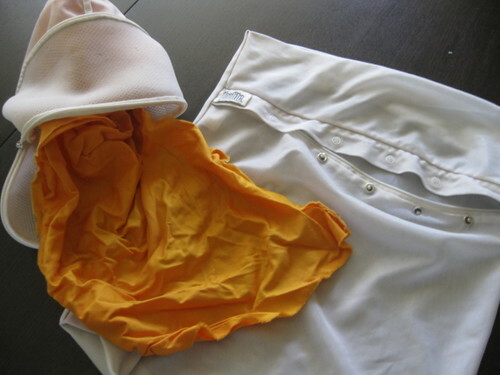 Hot water is more likely to cause color bleeding, so use a color catcher to protect your fabric purchase. Then, machine dry until almost dry. Nope, you can’t hang dry because it’s the machine drying that will cause shrinkage. You want to make the fabric shrink now, not later. I like to remove my fabrics from the delicate bag and put them back in the drier for 15 more minutes. This releases creases that are otherwise quite hard to iron out. Iron your fabric asap and while it’s still just slightly damp so that those creases don’t get heat set in the dryer! 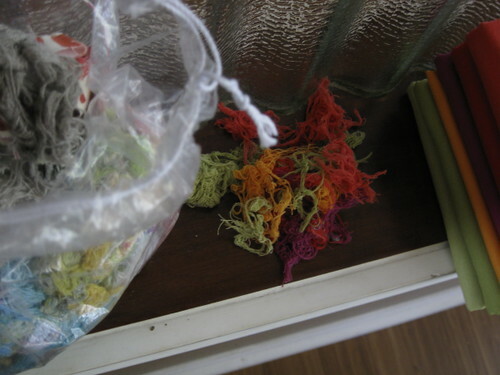 Confession – I save my unravelled threads. They’re so soft and spongy and pretty! My daughter occasionally wants stuffing for her sewing projects. This’ll be perfect. Besides, I feel better not throwing it away. Folding – so obvious. But, what I want to suggest here is that you choose a particular folding style and stick to it. Every fabric store seems to fold and ship fabric differently. If you want your fabric to store nicely in the cabinet (which you so totally do, right?) you need to be consistent. Some people use a quilting ruler to fold with, as a template. I simply eyeball it, knowing the shape I aim to achieve. Store your fabric somewhere out of the light and protected from dust. A cabinet or drawer is ideal. Make sure you peak in at it often to check that it’s happy ;0). Arrange and rearrange to achieve optimal viewing pleasure. So, you have a sewing machine, a little help and some ideas… you’re next step is to buy fabric! Buying fabric is the most expensive part of sewing, so take it slow. Here are some ideas for new shoppers. Before you shop, work to pin down some sort of concept. Shopping freestyle is often wasteful. Figure out a color concept – vivid jewel tones, soft vintagey pastels, lots of contrast or maybe two complimentary colors (blue/green or red/purple). Imagine how you’d like the finished project to fit in your home. Is it to be a stand-out piece or part of a cohesive whole? Are you going for classic, nature-inspired, bold, artsy, ultra-feminine, what? Unless you like the idea of investing in fabric that you may not use for years, don’t buy without a concept in mind. Watch for Scope & Color. I’ll admit that there’s a place for buying fabric “just because.” But it can be tough to know which fabrics will be useful somehow and which will linger in your stash untouched. My first fabric purchase was about a year ago. Here are a few yards from that initial order that I’ve still not used. Some of those prints are really large. I didn’t realize that large prints can be quite limiting. Othertimes my cuts were too small for projects I eventually dreamed up. Also I found that prints with a wide range of colors were less useful than more monochromatic prints. For example, I’ve used Filigree in sooooo many projects, but this Alexander Henry Birdsong print has yet to find a home. Fat Quarters: patches on projects like this rug or my Christmas stockings; mini quilts; coasters, potholders. 1/2 Yards: a child’s top or skirt (just barely), backing for a pillow or apron, a purse, 5-6 half yards together will make a nice sized quilt top. 1 Yard: a child’s dress, a sleeveless women’s top, a large purse. 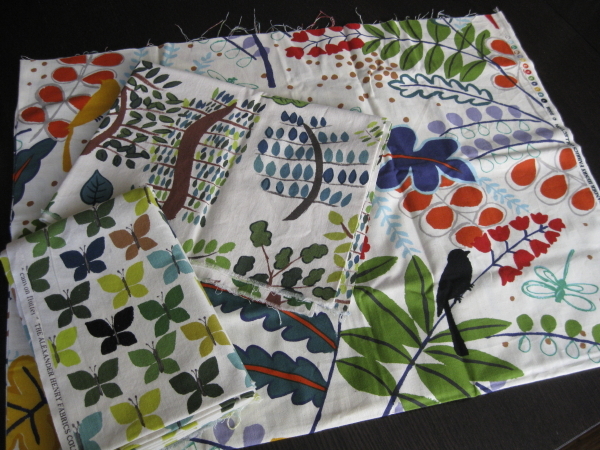 2-3 Yards: short curtains or valances, adult pajama pants, backing for a baby quilt or kitchen rug. 4-5 Yards: backing for a nice sized quilt, floor length curtains. When in doubt, buy a bigger cut and know that you can make good use of any extra! It’s been a year now since I picked up sewing. I have to say it’s absolutely exhilarating to be able to make my own life this way. But, you know, I think it’s a shame that I waited so long. I was definitely under the impression that sewing would be hard, really haaaaard. Sewing is actually a lot like driving a car. Sure, it can be dangerous and you do need some training, but anyone can do it – really! But, you’re never going to learn to drive if you don’t get behind the wheel and start. Sewing is just the same. Step #1 – Own a sewing machine. If you really want to sew you need to make that initial investment to get a machine in your home. For a long while I told myself that I could sew at my mother-in-law’s. But, it’s like exercise – if it’s that inconvenient you’ll likely never do it. Here’s a post at Sew Mama Sew about how to shop for your sewing machine, along with a link to machine reviews. I bought a $200 machine from Sears, and it’s working out quite nicely. 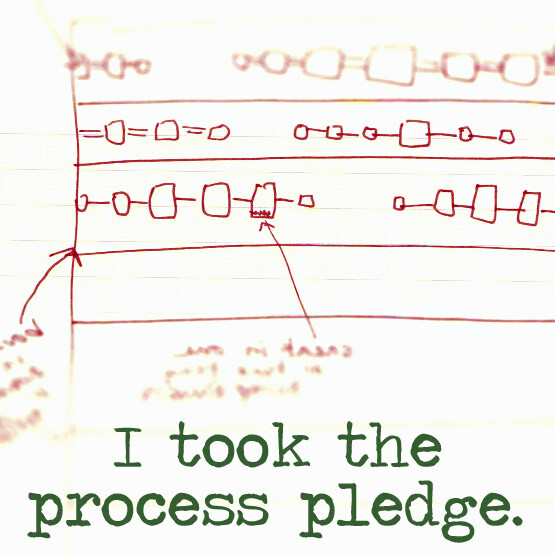 Step #2 – Choose a project. 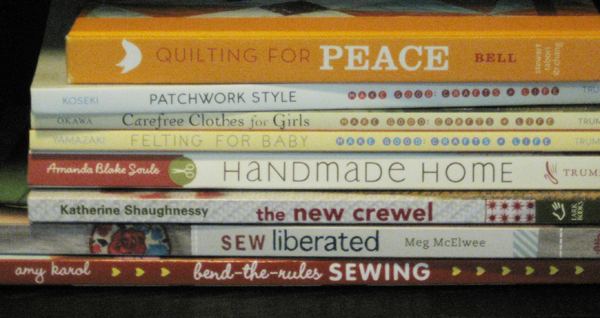 You could take a sewing class or read a general “how to sew” type of book, but who really has time for that? 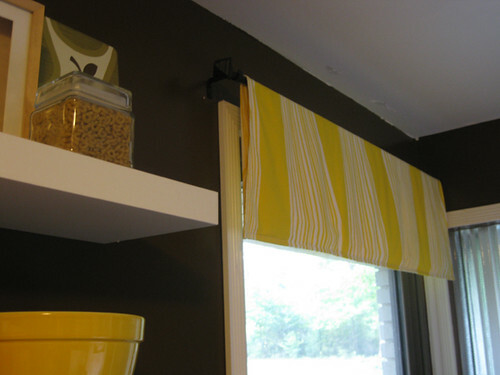 I took that first step by deciding to make flat valances for my kitchen windows. A “useful” project was the motivation I needed and the key to receiving the initial go-ahead from my husband to buy supplies. Step #3 – Get Help. 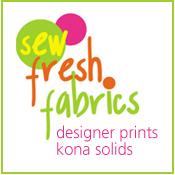 Do you have a sewing friend or relative that can help you get friendly with your sewing machine? Be sure to read your machine’s manual (and keep it handy)! 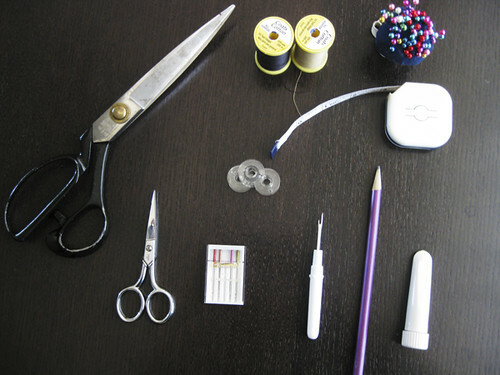 It may help to refer to a general sewing book as well for the basics. I learned a lot from Bend-the-Rules Sewing by Amy Karol. Also connect with the sewing community online through blogs and Flickr (oh, great – you’re already here!). Step #4 – Finish! It won’t be perfect; it probably won’t be easy, but you’ve got to finish! All the imperfections seem glaring when you’re in process, but once you hang those curtains up (crooked stitching and all), you’ll forget about all that. Your friends will notice you beaming and finally realize that you’re all giddy about your latest sewing project as you gesture wildly in the direction of your windows.